The Local Elections Archive Project was started and is maintained by Andrew Teale, and was the first single online resource for Great Britain local election results. Andrew grew up in the Metropolitan Borough of Bury, in Prestwich and then in Ainsworth, and now lives and works in Bolton. He started LEAP in 2002, the first local election in which he was eligible to vote, after being surprised that there was no similar resource available on the internet at the time. Ten years on, LEAP keeps Andrew off the streets. Andrew doesn't go in for much political activity, but is a member of the Electoral Reform Society and part of the successful Astley Bridge Conservative Club quiz league team. He writes weekly by-election previews for the Britain-Votes blog and was runner-up in the Personality of the Year 2011 competition on the Vote UK psephological web forum. Andrew takes quiz very seriously. As of November 2013 he was ranked 40th in the UK by the British Quiz Association (his highest ranking was 30th in the June 2011 ranking list) and holds the BQA title of "Candidate Master". He played for the Welsh national quiz team in 2007 and for the Wales B quiz team at the 2006, 2007, 2010, 2011 and 2013 European Quizzing Championships. At the 2006 World Quizzing Championships he was the winner of the "Last Man Standing" competition. 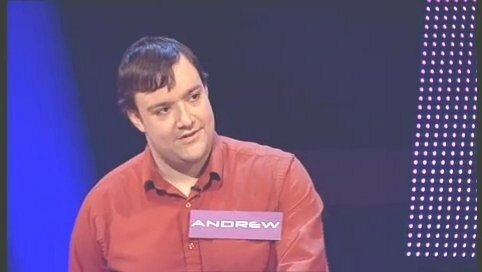 In Bolton Andrew plays for Astley Bridge Conservative Club in the Bolton Premier Quiz League and has won the league seventeen times and the league's Ron Lewis Trophy seven times. In the Bolton Open Charity Quiz League Andrew has one league win as captain of the Top Bull team and two cup wins as captain of the Taskers Team; he has also won the Bolton Mastermind competition, taking as his specialist subject the TV series "Father Ted". and won £1,000 on the BBC2 quiz show Battle of the Brains in 2009 as part of the Quizzee Rascals team. He appeared in the 2010/11 series of BBC Mastermind and finished third in his heat. After appearing in 2012 on the Sky Atlantic quiz show Cleverdicks, he returned to Mastermind for the 2013/14 series and was runner-up in his heat, taking King Henry I. Despite this, he was invited back for the 2014/15 series, winning his heat with the subject General James Wolfe and finishing fourth in the semi-final (King Henry VII). He had a further go in the 2017/18 series, finishing third in his heat with the subject Thomas Becket. Andrew's other hobby is playing clarinet in the Lancashire band of the Royal Regiment of Fusiliers, which took him in 2008 to the Canadian Military Tattoo in Hamilton, Ontario, and in 2011 and 2018 to the Last Post ceremony at the Menin Gate, Ieper, Belgium. Results for national elections - David Boothroyd's website http://www.election.demon.co.uk. Results for local by-elections - Keith Edkins' website http://www.gwydir.demon.co.uk/byelections/. Results for Northern Irish elections - Nicholas Whyte's website http://www.ark.ac.uk/elections/.